Where is the Evidence that Hyperthermia Works? If you want irrefutable proof that hyperthermia works, visit the US National Library of Medicine's website PubMed.gov, a division of the National Institute of Health (NIH). PubMed is a repository of over 26 million citations for biomedical literature. Using the search bar, type in “hyperthermia cancer treatment” and you will find over 25,000 results. Too many results than most of us would find useful, so we narrowed down the list. 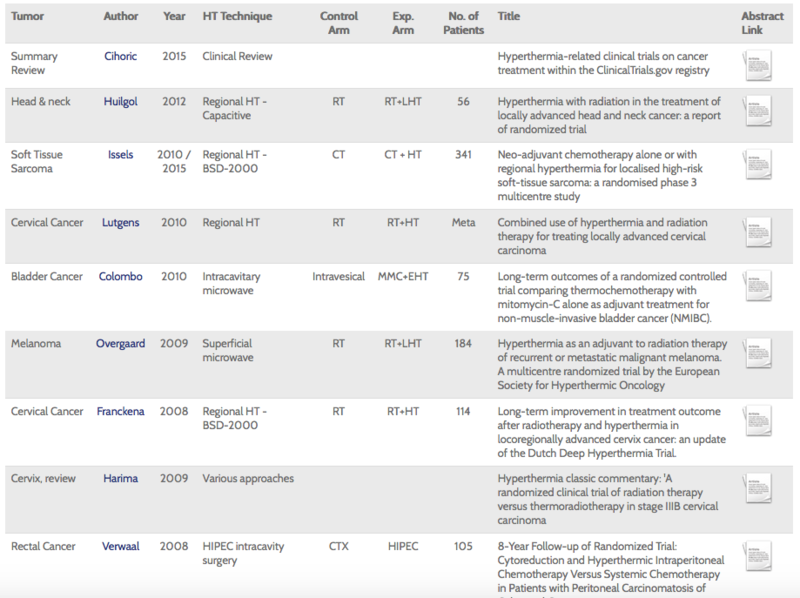 The link below contains completed randomized trials using hyperthermia as an adjunct to radiation therapy and chemotherapy over the last 30 years. The studies reveal a higher tumor response when hyperthermia is added over chemotherapy and/or radiotherapy alone. Several of the studies use Pyrexar Medical equipment or lab built equipment using the same or similar radio frequency energy delivery system. So the next time someone challenges you with “where is the evidence that hyperthermia works?”, just send them to evidence.pyrexar.com and let them read it for themselves.